Rooster Teeth and Cinedigm (NASDAQ: CIDM) recently announced that the newest story in the Red Vs. Blue universe will arrive on digital platforms on November 6th, 2018 and Blu-Ray® + DVD Combo Pack on January 1st, 2019. Red Vs. Blue follows two groups of soldiers in the distant future who are battling for control of the least desirable piece of real estate in the known universe: a box canyon in the middle of nowhere. "The Shisno Paradox has already amassed quite a buzz among fans with 470,00 views on YouTube for just the introduction to the show! "The fan base for this series is so dedicated, which is showcased by the fact that Red Vs. Blue is internet’s longest running web series, and we look forward to being offer our fan base the chance to own the latest in chapter in the RVB universe," said Joe Nicolosi, Director of Red Vs. Blue. In 'Red Vs. Blue: The Shisno Paradox', a simple trip out for pizza ends with the Reds and Blues scattered and lost in time. Their ridiculous adventures in history inadvertently make them pawns in a war between Gods and Titans, which has been raging since before the dawn of time. The Red Vs. Blue franchise, which is based on the best-selling Xbox video game Halo, has had over one billion total views online with over one million DVDs sold. The Blu-Ray® + DVD Combo Pack and digital release will be jam-packed with bonus features including behind-the-scenes, director/writer commentary and crew photos. 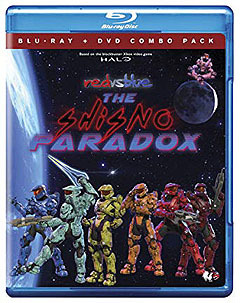 Again, 'Red vs. Blue: The Shisno Paradox' is now available on Digital, and it will be available on Blu-ray and DVD on January 1st, 2019! If you would like to win a copy of 'Red vs. Blue: The Shisno Paradox' on Blu-ray+DVD Combo Pack, just answer this question about the characters from the series: Which actor is best-known for voicing Private Michael J. Caboose in this Rooster Teeth web series Red vs. Blue (2003–present)? 'Sgt. 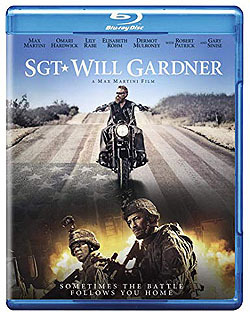 Will Gardner' tells the story of Iraq War veteran Will Gardner (Max Martini) who is suffering from a traumatic brain injury (TBI) he sustained with his platoon while in combat. Along his journey, he tries to pick up the pieces of the life he's lost since returning from combat. His PTSD causes frequent flashbacks to the Iraq War which he survives by having frequent conversations with Sam (Omari Hardwick), his best friend and war buddy. Martini, who also wrote and directed the film hopes this movie serves as a reminder and a call to action. In this spirit, his producing moniker, Mona Vista Productions, will donate a portion of the film’s proceeds to three charities that support veterans suffering from Traumatic Brain Injury (TBI), PTSD and veteran homelessness: Higher Ground, Warriors Heart and the Gary Sinise Foundation. Send us your answers and if you're correct you'll be in the running to win one of these new Blu-rays! 'Sgt. Will Gardner' will be on sale February 19th, 2019 via Cinedigm.